in Stock (Essex) and Attleborough (Norfolk). Free local delivery service* for customers across the whole of East Anglia. 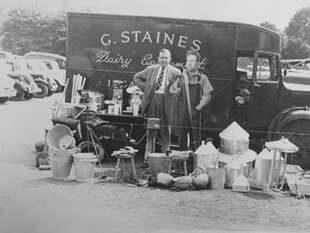 Established in 1946 by George Staines, developed and expanded by his son John Staines, who is now, in turn, ably assisted by his son Matthew. At G & J Staines we have witnessed a great deal of change to agriculture and the rural communities in East Anglia over the ensuing years but one thing has remained unchanged for everyone at G & J Staines, the principle of our business; providing first class customer service. With two fully stocked and staffed stores, in Stock (Essex) and Attleborough (Norfolk), and the ability to offer a free local delivery service*, we cater for the needs of our customers across East Anglia. Providing first class customer service for over 60 years. ...into Cambridge, Peterborough & Hertfordshire. * Subject to terms and conditions, enquire at your local branch. G & J Staines is a livestock specialist, with two fully stocked and staffed stores, in Stock (Essex) and Attleborough (Norfolk). Free local delivery service* for customers across the whole of East Anglia.